Pristine white sand beaches, turquoise waters, picturesque sunsets and the balmy ocean breeze make the CARIBBEAN one of the most preferred wedding destinations among engaged couples! Choose from a number of the most popular islands to make your wedding truly MAGICAL! Getting married in Antigua is easy! Even cruise ship visitors can get married here...there is no requirement for any period of residency, so arrangements can be made immediately on arrival. A quick trip to the Ministry of Legal Affairs and Registrar General's Office located in downtown St. John's to present appropriate documentation, fill out the application and pay the appropriate fees for a legal and binding marriage between husband and wife! The tropical paradise of Aruba, an island with sunshine, warm temperatures, cooling trade winds, brilliant sunsets, and a location at the south fringe of the hurricane belt can make for a truly MEMORABLE Destination Wedding! Couples wishing to secure a legal marriage in Aruba must be married at City Hall in Oranjestad, prior to a beach or church wedding. With 700 islands sprinkled over 100,000 square miles of ocean, just 50 miles off the coast of Florida and hundreds of resorts to choose from, the Bahamas is the perfect place for a couple looking to marry at a gorgeous destination! Weddings must be performed between sunrise and sunset by a Marriage Officer licensed to perform marriages in the Commonwealth of the Bahamas. The wedding couple must arrive in the Bahamas 24 hours before applying for a marriage license, which can be obtained at the Administration Office on the island where the wedding will take place. The natural beauty of Barbados beckons all seeking a romantic escape! It is very easy to get married on this coral island fringed with all white sand beaches, crystal-clear waters and breezy palms! In Barbados you can get married on a boat, in a church, by sea cliffs or soft sand beaches. With no required waiting period or minimum length of stay, you can even be married on Barbados when in port for the day from a cruise ship! For couples looking to plan an exotic island Destination Wedding, the Cayman Islands offers something few destinations can match...exquisite natural beauty infused with civility and commitment. The result is a sort of "barefoot elegance" that promises to make your special day truly REMARKABLE! 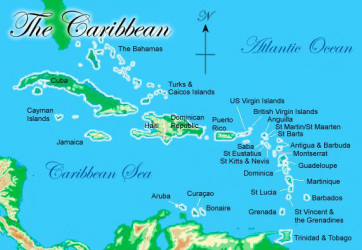 Couples, including those arriving by cruise ship, can marry the same day they arrive in the Cayman Islands. A non-residents marriage license and a letter from the authorized Marriage Officer who is to officiate, as well as 2 witnesses are all you need. Couples planning a Destination Wedding will find the Dominican Republic is an incredible island paradise in the heart of the Caribbean... a perfect place for their most special day! Outstanding beaches, glimmering ocean waters, lush landscape and a temperate climate make weddings in the Dominican Republic an EXTRAORDINARY experience! No residency requirements or blood tests are necessary to be married in the Dominican Republic, however the resort may require your arrival up to 3 business days prior, to prepare for your ceremony. The official performing the ceremony, will present the couple with the document needed to prove that the wedding took place. This document will need to be presented to the local Justice of the Peace who will issue a marriage certificate that is valid anywhere in the world. Getting married in Jamaica couldn't be more simple, with affordable fees and no residency requirements, including cruise ship passengers who can be married the same day they arrive in port. Couples in search of a rich cultural experience in a setting of captivating beauty, Jamaica presents a fascinating diversity of options within its most popular areas of Montego Bay, Ocho Rios and Negril. With plenty of direct flights to San Juan, no passports required and U.S. dollars as the legal tender, Puerto Rico is an uncomplicated destination wedding locale! This tropical island's Latin flavor features spicy cuisine and sizzling nightlife as well as Old World charm, Spanish influenced architecture and gorgeous plam tree lined beaches! The wedding couple must appear at the City Court office to purchase a marriage license after presenting documentation including medical certification within 10 days of marriage showing compliance with tests required for marriage in their state of residence...if your state requires a pre-marriage blood test, then you must comply. St. Lucia has long been a dream destination for wedding and honeymoon couples! Experiencing spectacular scenery, strolling along a golden-sand beach, relaxing over an amazing sunset and swaying to the melodies of Caribbean music makes Saint Lucia one of the most romantic islands in the Caribbean! If you’re looking to escape to a simple, romantic island wedding getaway with no passports required and simple marriage laws, the U.S. Virgin Islands are ideal! Historic churches, romantic resorts, unique wedding locales and glorious palm-fringed beaches provide the ultimate setting for a tropical Caribbean wedding! Couples who regard a "PERFECT BEACH" as a top priority may consider Turks and Caicos for their Destination Wedding ~ Conde Nast Traveler has consistently named Turks and Caicos as the “Best Tropical Beaches in the World”! Providenciales is the most well know of the Turks and Caicos Islands and is the center of the tourism industry with a wide range of hotels. There is a a 24 hour residency requirement for couples wishing to marry here, with the ceremony allowed to take place 48 hours after the marriage license is granted. However, cruise ship passengers can now apply for a special license for a marriage in Turks and Caicos on the same day of arrival!